A query is the same thing as a search. When you do a query, you are asking a database to find all of the data that is related to the terms, phrases, or features that you choose. This is similar to how an internet search engine finds specific web pages when you type in the phrase "mountain bikes", or a computerized library system finds specific books, magazines, or authors related to "bluejays". Which Surface Water Intakes are within .5 miles of a river? As we saw earlier, we have the Surface Water Supplies, Rivers, and County Boundaries all combined into one digital map using GIS software. The next step is using the Query tool to choose the specific data features you want. This process asks the database specifically what to look for. 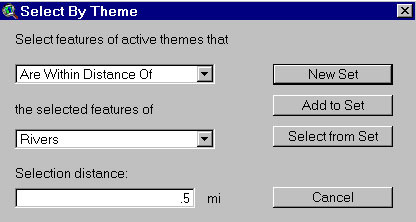 In this case we are asking the GIS to select the Surface Water Intake features that are within a .5 mile distance of a river. 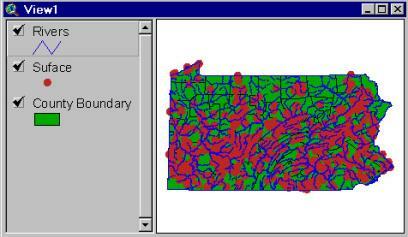 The GIS then displays the data which matches your query, or your search criteria. In this case, the features highlighted in yellow are all the points that are within .5 miles of a river. Check the query by zooming into the view, and measure any of the surface water intake points that are highlighted in yellow. One of the points measured .33 miles of a river, so the query has been successful.